Adams County Habitat for Humanity is a ministry based on Christian principles—that we must love and care for one another, expressed not only by words, but by action. Habitat provides the opportunity for volunteers to put their faith and love into action! Volunteers lend a hand at a recent Adams County Habitat build site, while some take a much-deserved snack break. Volunteers are essential to Adams County Habitat for Humanity–more than 300 volunteers spent nearly 1,500 hours working on houses in 2012. Hundreds of additional hours are donated to the organization annually through the work of board members. 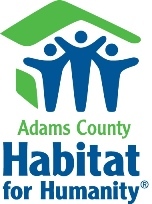 Generally, Adams County Habitat kicks off the building season with a two-week Blitz Build every June. This is a period of intense building to jump-start construction of a new home(s). Through the summer season, construction usually continues every Saturday at the build site until the home is completed.